It helps to work with professionals. Find a mentor, hire a public-speaking coach or join the local outfit of Toastmasters. While these approaches may have costs associated with them, the benefits of what you will learn will be worth it. Focus on ensuring the audience will truly benefit from what you have to say. Put yourself in their shoes and imagine what would be a valued take-away. While it’s tempting to use a speaking engagement to promote your product or service and win new clients, the audience will sense the selling right away and you will be fighting an uphill battle to gain their attention and trust. Slides can add a great deal of visual enhancement to a presentation. However there are a couple of rules to follow while preparing them. First, avoid overloading your slides with too much small text. Here’s a simple rule of thumb: Your font size should be approximately double the average age of the audience (usually resulting in a font size between 50–80 points). If your points don’t fit on the slide, you need to tighten your message. With that said, NEVER EVER read your slides. This is a surefire way to bore the audience. They can read the slides just as easily as you can. Slides are there to help emphasize your points; they should never be the point. Personal stories and other humanizing elements help the audience both to connect with your message and to remember it. Just be sure that they are genuine. Most audience members will see through phony stories that are only added to increase the entertainment value of your presentation. Presentations are like conversations. If only one person is actively involved, others tend to lose interest. 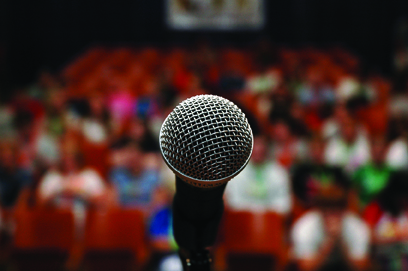 There are several ways to involve the audience in your speaking. One easy way is to start with a problem statement, “How many of you have had to deal with…” or “Raise your hand if you have ever had to…” This type of Q&A with the audience will heighten their attention, as they are now expected to interact with your content. Practicing in front of people with a stopwatch is a must. Practice the flow of your presentation and making eye contact with the audience, while paying attention to time. You should always aim to run short. This will allow for you to answer questions from the audience and build goodwill by showing that you respect their time. One final tip: It always helps to speak about your passion. While this isn’t always possible, you are much more likely to inspire and excite an audience when you are speaking on something you feel strongly about.